Please note: We endeavour to keep market details, schedules and contact telephone numbers up to date, but these are subject to change without notice or our knowledge. If you see an error or find an omission, please contact us with the link below. Attention markets co-ordinators & managers. Stall holders and market visitors are looking for you here. about a Detailed link display or classified listing to maximise your exposure. 15 February, 2019 Caldera Farmers Markets now called Murwillumbah Farmers Markets, every Wednesday 7am-11am, Murwillumbah Showground. For more information on community markets and monthly weekend markets, watch local media when in the region, or just follow the signs on the day! Visitors from Byron Bay are encouraged to use tour bus services like the Nimbin Shuttle for The Channon, Nimbin and Bangalow Markets. Dogs are prohibited at all markets. At weekly Farmers Markets and organic markets, customers can talk to the farmer directly about the produce and farming methods. Some farmers markets are incorporated into weekend markets, but usually there are regular separate week day stalls and stands at various locations throughout the region. Please note that many markets are now "plastic bag free", so be sure to bring your own bags along, or buy a reusable carry bag on the day to keep as a souvenir and reuse. When on country drives, also look out for roadside stalls, where fresh fruit and veges are sold direct at the farm gate. Join our Weekly Markets mail list, and get page updates notices. Australian seafood, grain fed and hormone free meats, free range eggs and more. Local businesses, food, arts, crafts, music and childrens activities. Certified organically grown, seasonal fresh veges and fruit. Local fresh fruit & vegies, preserves, plants, honey, coffee etc. Recycled Fashion, Homewares, Art, Beauty, Food + Coffee. 3rd Sunday : March, July, November only. 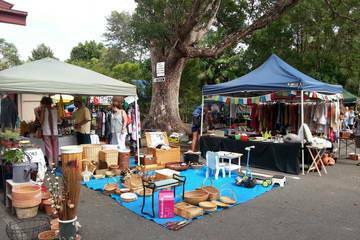 Homemade, Handmade, Home grown, Recycled, Upcycled and Organic stalls. "Variety of stalls, hot food, espresso coffee, entertainment and a playground onsite all with a great country atmosphere."